For some time now, Winnipeg’s municipal governance has had its share of negative press. Procedural mismanagement and a lack of transparency have dominated the civic discourse, leaving little room for debate over progressive policy. If early mayoral-candidate announcements are any indication, the October 2014 election will deal with themes of transparency, accountability, and the culture on Main Street. But this should not put important policy debates on the back-burner. Visions for municipal government have often been narrow – pick up the garbage, fill the potholes, and keep taxes down. But across the country, and across the pond, municipal governments have been thinking beyond logistics and are harnessing the potential for municipal governance – including powerful policies for community economic development. Indeed, sections of the AMB explore specific CCEDNet – Manitoba policy resolutions. The chapter on Housing discusses Winnipeg’s current housing crunch, exemplified by 37.5% of renters being in core housing need. Consistent with CCEDNet – Manitoba’s Affordable and Social Housing policy resolution, the AMB considers serious investments in affordable housing rehabilitation and development. A policy not on CCEDNet – Manitoba’s books, the AMB also looks at inclusionary zoning – a mandate from the City that new residential developments include affordable units, or developers pay an opt-out fee which will be invested in other affordable housing programs or projects. The AMB’s discussion of Employment and Training includes two CCEDNet – Manitoba policy resolutions: Community Benefit Clauses and Living Wage. The City has a tremendous amount of purchasing power, which can have a tremendous impact on our communities. By including social and economic outcomes as a weighted criteria in public bids through a Community Benefit Clause, the City can ensure the value provided by social enterprises hiring and training people with barriers to employment are measured and rewarded. Ensuring that all direct and contracted employees of the City are paid a living wage will mean that Winnipegger’s who work full time will not be living in poverty. Finally, the AMB chapter on Food Security calls for the establishment of a Winnipeg Food Policy Council. A CCEDNet – Manitoba policy resolution and a long-standing body in many other Canadian cities, a food policy council would be made up of stakeholders from multiple departments, all aspects of food production, and community representatives – anti-hunger and food justice activists, educators, non-profit organizations, newcomers, and Aboriginal people. The council would evaluate and develop policy surrounding food security in Winnipeg. From Planning, to Policing, to Arts and Culture, the Alternative Municipal Budget Winnipeg 2014 brings community organizers, academics, and activists together to discuss policy options that would lead to a more sustainable, inclusive, and just Winnipeg. Congratulations to the Canadian Centre for Policy Alternatives – Manitoba and all fellow contributors for this inspiring document. Darcy Penner is a Research & Policy Advisor with the Canadian CED Network. He has been working in community development through various capacities since graduating from the University of Winnipeg with a BA (Honours) in Politics. 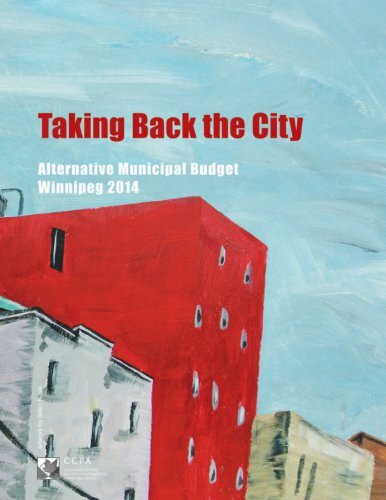 Darcy was also a contributing author to the Alternative Municipal Budget for CCEDNet-Manitoba.